The Accredited Buyer’s Representative (ABR®) designation is the benchmark of excellence in buyer representation. This coveted designation is awarded by the Real Estate Buyer’s Agent Council (REBAC), an affiliate of the National Association of REALTORS®, to real estate agents who meet the specific educational and practical experience criteria. 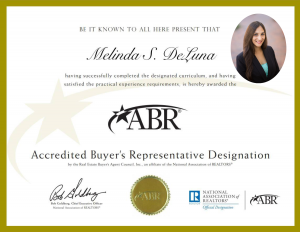 We are very proud to announce that Rabell Realty Group’s own Melinda DeLuna REALTOR® just earned her Accredited Buyer’s Representative (ABR®) designation this month. A Gainesville native and busy mom of four, Melinda holds degrees in Journalism (AA) and Telecommunications (BS) from Santa Fe College and the University of Florida. Melinda credits her passion for learning and people for fueling her pursuit of continual professional growth and education as a real estate professional. With the Accredited Buyers Representative (ABR) designation, Melinda has gained valuable real estate education and further elevated her skills and knowledge in working directly with home buyers here in Gainesville and North Central Florida. Congratulations, Melinda! We applaud you for this industry achievement, and for always striving to hone your expertise as a real estate agent to better serve your customers and help them achieve their real estate goals. Connect with Melinda DeLuna REALTOR®, ABR, GRI at Melinda@BuySellRabell.com or (352)871-9456.